Hi, I'm Jimmy. I am a doctor, a "rejuvenating" corporate CEO, an entrepreneur, an author, and a speaker. A while back, when I was a business partner with the well-known personal development coach, Tony Robbins, I discovered my purpose in life (during Tony's wonderful Date With Destiny program). That purpose is ... to be a positive, creative force for health and happiness. And nearly everything I do is directed toward that purpose. Whether it was treating sick people when I was a practicing doctor, leading a corporate team to success when I was a CEO, or now - working on this website and my books as an author, I always want people to be happy! That's why I wrote the book, BeHappy!, and created this website. The goal is to make this world a better, happier place. And that's also why I left my corporate upper-six-figure-income-job as CEO of a biotech company to better pursue this mission. So if the information on this site helps you and you'd like to make a donation to BeHappy101.com, please click on the button below to make a contribution. The amount you donate is entirely up to you and is greatly appreciated. All four of us made the 10,000 mile "triangle tour" every single month for several years. It was very adventurous ... yes ... and very hectic and stressful. Our now-seven-year old daughter has over a half a million miles in the air and our dog had over half a million miles before he died last year! Now, we have a second baby daughter - Jae. She's already four years old and has flown more than most 20 year olds. (1) help you get to know me a bit and (2) provide an example of how I am setting up my life to be as happy as I can be - since I love to travel and adventure/variety is important to me. It's part of my personal Definition of Happiness. My passions are family, friends, music, travel, photography, health, and fitness. I hope that, through this website, my books, my BeHappy! Newsletter, and the many "happiness-building" products, services, and freebies which are currently available - and will become available - on this website, your life will be happier and more balanced, passionate, and fulfilled. I wake up everyday between 5:00 and 6:00 a.m. I plan to live to be at least 95 years old, so I take care of my health through proper nutrition and exercise. And since I am committed to being a positive, creative force for health and happiness, I spend a lot of time on this website and on the various components of the site (like the BeHappy! Blog and the BeHappy! Newsletter). 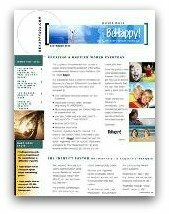 So, if the information on this site helps you and you'd like to help me help others ... please consider making a donation to BeHappy101.com by clicking on the button below to make a contribution. The amount you donate is entirely up to you and would be greatly appreciated. The Newsletter is sent out every other month. Each edition will take you another step closer to your happiest possible life. So subscribe NOW simply by filling in the information below and I'll send it out to you.